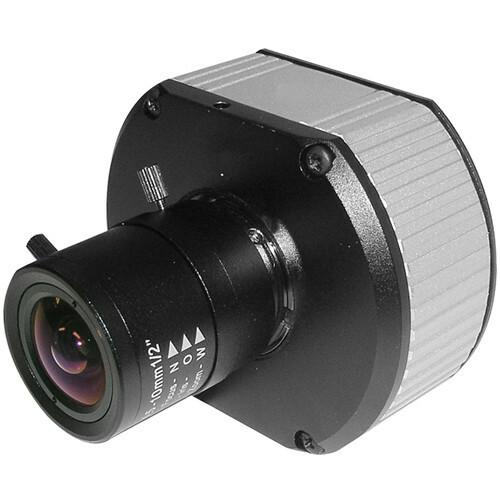 The Arecont Vision AV10115 10 MP/1080p Dual Mode H.264 IP MegaVideo Color Camera is an innovative security device designed to deliver videos with unparalleled high-definition resolution up to 3648 x 2752. With its 10 MP CMOS sensor, the camera can capture excellent imagery of the surveillance area at up to 7 fps. With the forensic zooming feature, the MegaVideo Camera allows you to zoom in on specific portions of the live recording or after-event video, when simultaneously recording the full field-of-view in HD. This is useful when CCTV video footage needs to be previewed and analyzed in criminal and other legal cases. All this is possible thanks to Arecont Vision's MegaVideo image processing that helps the camera perform 80 billion operations per second to deliver full resolution videos and region of interest streams. Video footage can be stored in either MJPEG or H.264 (MPEG4, Part 10) compression format, which provides small-sized files and uses less network bandwidth. For efficient data management, you can send videos up to 8 concurrent, non-identical streams with different frame or bit rates, resolutions, and picture quality. With up to 1024 distinct motion detection zones, the camera triggers an alarm if any movement is detected in these zones for efficient video recording. You can also protect the privacy of people in the surveillance area by blocking multiple regions of a video in almost any arbitrary shape. The Power over Ethernet feature (PoE) transfers both power and data over a single Ethernet network cable, eliminating the need to install the camera near a power supply.